^ a b c d e King, TE, Jr. (March 2008). "Sarcoidosis: Interstitial Lung Diseases: Merck Manual Home Edition". The Merck Manual Home Edition. Merck Sharp & Dohme Corp. Retrieved 19 February 2014. ^ a b c d e f g h i j k l m n o p q r s t u Fauci, A.; Kasper, D.; Hauser, S.; Jameson, J.; Loscalzo, J. (2011). Harrison's Principles of Internal Medicine (18 ed.). New York: McGraw-Hill Professional. ^ Baughman RP, Culver DA, Judson MA; Culver; Judson (March 2011). "A concise review of pulmonary sarcoidosis". American Journal of Respiratory and Critical Care Medicine 183 (5): 573–81. ^ a b c d e f Kamangar, N; Rohani, P; Shorr, AF (6 February 2014). Peters, SP; Talavera, F; Rice, TD; Mosenifar, Z, ed. "Sarcoidosis Treatment & Management". Medscape Reference. WebMD. Retrieved 19 February 2014. ^ a b c d e f g h i j k l m n o p q r s Nunes H, Bouvry D, Soler P, Valeyre D; Bouvry; Soler; Valeyre (2007). "Sarcoidosis". Orphanet J Rare Dis 2: 46. ^ a b c d King CS, Kelly W; Kelly (November 2009). "Treatment of sarcoidosis". Disease-a-month 55 (11): 704–18. ^ a b c d e f g h i j k l Kamangar, N; Rohani, P; Shorr, AF (6 February 2014). Peters, SP; Talavera, F; Rice, TD; Mosenifar, Z, ed. "Sarcoidosis". Medscape Reference. WebMD. Retrieved 19 February 2014. ^ "Sarcoidosis" (PDF). State of Lung Disease in Diverse Communities. American Lung Association. 2010. Retrieved 21 February 2014. ^ a b James DG, Sharma OP; Sharma (September 2002). "From Hutchinson to now: a historical glimpse" (PDF). Current Opinion in Pulmonary Medicine 8 (5): 416–23. 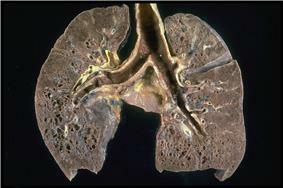 ^ "Lung Diseases: Sarcoidosis: Signs & Symptoms". National Heart, Lung, and Blood Institute. Retrieved May 9, 2009. ^ Kamangar, N; Rohani, P; Shorr, AF (6 February 2014). Peters, SP; Talavera, F; Rice, TD; Mosenifar, Z, ed. "Sarcoidosis Clinical Presentation". Medscape Reference. WebMD. Retrieved 19 February 2014. ^ Sweiss NJ, Patterson K, Sawaqed R, Jabbar U, Korsten P, Hogarth K, Wollman R, Garcia JG, Niewold TB, Baughman RP; Patterson; Sawaqed; Jabbar; Korsten; Hogarth; Wollman; Garcia; Niewold; Baughman (August 2010). "Rheumatologic manifestations of sarcoidosis". Seminars in Respiratory and Critical Care Medicine 31 (4): 463–73. ^ a b c d e f g Holmes J, Lazarus A; Lazarus (November 2009). "Sarcoidosis: extrathoracic manifestations". Disease-a-month 55 (11): 675–92. ^ a b Dempsey OJ, Paterson EW, Kerr KM, Denison AR; Paterson; Kerr; Denison (28 August 2009). "Sarcoidosis". BMJ 339: b3206. ^ Baughman RP, Lower EE, Gibson K; Lower; Gibson (June 2012). "Pulmonary manifestations of sarcoidosis". Presse medicale 41 (6 Pt 2): e289–302. ^ Fuhrer G, Myers JN; Myers (November 2009). 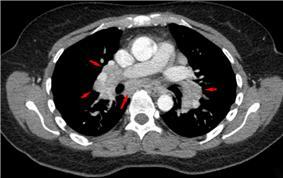 "Intrathoracic sarcoidosis". Disease-a-month 55 (11): 661–74. ^ Nunes H, Uzunhan Y, Freynet O, Humbert M, Brillet PY, Kambouchner M, Valeyre D; Uzunhan; Freynet; Humbert; Brillet; Kambouchner; Valeyre (June 2012). "Pulmonary hypertension complicating sarcoidosis". Presse medicale 41 (6 Pt 2): e303–16. ^ a b c d e Chen ES, Moller DR; Moller (12 July 2011). "Sarcoidosis—scientific progress and clinical challenges". Nature reviews. Rheumatology 7 (8): 457–67. ^ a b Mañá J, Marcoval J; Marcoval (June 2012). "Skin manifestations of sarcoidosis". Presse medicale 41 (6 Pt 2): e355–74. ^ Heath CR, David J, Taylor SC; David; Taylor (January 2012). "Sarcoidosis: Are there differences in your skin of color patients?". Journal of the American Academy of Dermatology 66 (1): 121.e1–14. ^ Lodha S, Sanchez M, Prystowsky S; Sanchez; Prystowsky (August 2009). "Sarcoidosis of the skin: a review for the pulmonologist" (PDF). Chest 136 (2): 583–96. ^ a b James, WD; Berger, T; Dirk, M (2006). Andrew's diseases of the skin: clinical dermatology (10th ed.). Philadelphia: Saunders Elsevier. pp. 708–711. ^ House NS, Welsh JP, English JC; Welsh; English Jc (15 August 2012). "Sarcoidosis-induced alopecia". Dermatology Online Journal 18 (8): 4. ^ Doughan AR, Williams BR; Williams (2006). "Cardiac sarcoidosis". Heart 92 (2): 282–8. ^ a b Youssef G, Beanlands RS, Birnie DH, Nery PB; Beanlands; Birnie; Nery (December 2011). "Cardiac sarcoidosis: applications of imaging in diagnosis and directing treatment". Heart 97 (24): 2078–87. ^ Reuhl J, Schneider M, Sievert H, Lutz FU, Zieger G; Schneider; Sievert; Lutz; Zieger (October 1997). "Myocardial sarcoidosis as a rare cause of sudden cardiac death". Forensic Sci. Int. 89 (3): 145–53. ^ Rajasenan V, Cooper ES; Cooper (1969). "Myocardial sarcoidosis, bouts of ventricular tachycardia, psychiatric manifestations and sudden death. A case report". J Natl Med Assoc 61 (4): 306–9. ^ Chapelon-Abric C (2012). "Cardiac sarcoidosis". Presse Med 41 (6 Pt 2): e317–30. ^ Bodaghi B, Touitou V, Fardeau C, Chapelon C, LeHoang P; Touitou; Fardeau; Chapelon; Lehoang (June 2012). "Ocular sarcoidosis". Presse medicale 41 (6 Pt 2): e349–54. ^ Papadia M, Herbort CP, Mochizuki M; Herbort; Mochizuki (December 2010). "Diagnosis of ocular sarcoidosis". Ocular Immunology and Inflammation 18 (6): 432–41. ^ Qazi FA, Thorne JE, Jabs DA; Thorne; Jabs (October 2003). "Scleral nodule associated with sarcoidosis". American Journal of Ophthalmology 136 (4): 752–4. ^ a b c d e f g h Nozaki K, Judson MA; Judson (June 2012). "Neurosarcoidosis: Clinical manifestations, diagnosis and treatment". Presse medicale 41 (6 Pt 2): e331–48. ^ Said G, Lacroix C, Plante-Bordeneuve V; Lacroix; Planté-Bordeneuve; Le Page; Pico; Presles; Senant; Remy; Rondepierre; Mallecourt (2002). "Nerve granulomas and vasculitis in sarcoid peripheral neuropathy". Brain 125 (Pt 2): 264–75. ^ a b c d e f g h Vardhanabhuti V, Venkatanarasimha N, Bhatnagar G, Maviki M, Iyengar S, Adams WM, Suresh P; Venkatanarasimha; Bhatnagar; Maviki; Iyengar; Adams; Suresh (March 2012). "Extra-pulmonary manifestations of sarcoidosis" (PDF). Clinical Radiology 67 (3): 263–76. ^ Tavee J, Culver D; Culver (2011). "Sarcoidosis and small-fiber neuropathy". Curr Pain Headache Rep 15 (3): 201–6. ^ Heij L, Dahan A, Hoitsma E; Dahan; Hoitsma (2012). "Sarcoidosis and Pain Caused by Small-Fiber Neuropathy". Pain Research and Treatment 2012: 256024. ^ Porter N, Beynon HL, Randeva HS; Beynon; Randeva (2003). "Endocrine and reproductive manifestations of sarcoidosis". QJM 96 (8): 553–61. ^ Barbour GL, Coburn JW, Slatopolsky E, Norman AW, Horst RL; Coburn; Slatopolsky; Norman; Horst (August 1981). "Hypercalcemia in an anephric patient with sarcoidosis: evidence for extrarenal generation of 1,25-dihydroxyvitamin D". N. Engl. J. Med. 305 (8): 440–3. ^ "Rheumatology Diagnosis & Therapies" (2nd ed.). Philadelphia: Lippincott Williams & Wilkins. 2005. p. 342. ^ a b Antonelli A, Fazzi P, Fallahi P, Ferrari SM, Ferrannini E; Fazzi; Fallahi; Ferrari; Ferrannini (August 2006). "Prevalence of hypothyroidism and Graves disease in sarcoidosis". Chest 130 (2): 526–32. ^ Manchanda A, Patel S, Jiang JJ, Babu AR; Patel; Jiang; Babu (March–April 2013). "Thyroid: an unusual hideout for sarcoidosis" (PDF). Endocrine practice 19 (2): e40–3. ^ a b c d Fausto N, Abbas A (2004). Robbins and Cotran Pathologic Basis of disease. (7th ed.). Philadelphia, PA: Elsevier/Saunders. pp. 737–9. ^ Tokala, Hemasri; Polsani, Karthik; Kalavakunta, Jagadeesh K. (2013-01-01). "Gastric sarcoidosis: a rare clinical presentation". Case Reports in Gastrointestinal Medicine 2013: 260704. ^ Vera C, Funaro D, Bouffard D; Funaro; Bouffard (July–August 2013). "Vulvar sarcoidosis: case report and review of the literature". Journal of Cutaneous Medicine and Surgery 17 (4): 287–90. ^ a b Paknejad O, Gilani MA, Khoshchehreh M; Gilani; Khoshchehreh (April–June 2011). 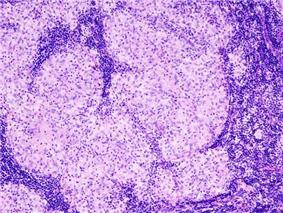 "Testicular masses in a man with a plausible sarcoidosis". Indian J Urol 27 (2): 269–27. ^ a b Paknejad O, Gilani MA, Khoshchehreh M; Gilani; Khoshchehreh (April–June 2011). 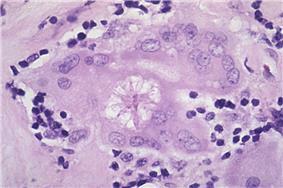 "Testicular masses in a man with a plausible sarcoidosis". Indian Journal of Urology 27 (2): 269–27. ^ Cremers JP, Drent M, Baughman RP, Wijnen PA, Koek GH; Drent; Baughman; Wijnen; Koek (September 2012). "Therapeutic approach of hepatic sarcoidosis". Curr Opin Pulm Med 18 (5): 472–82. ^ a b "Statement on Sarcoidosis" (PDF). American Journal of Respiratory and Critical Care Medicine 160 (2): 736–755. August 1999. ^ Wurm K, Löhr G; Löhr (1986). "Immuno-cytological blood tests in cases of sarcoidosis". Sarcoidosis 3 (1): 52–9. ^ Chen HC, Kang BH, Lai CT, Lin YS; Kang; Lai; Lin (July 2005). "Sarcoidal granuloma in cervical lymph nodes". Journal of the Chinese Medical Association 68 (7): 339–42. ^ a b c d e f g h i j k l m n o Rao, DA; Dellaripa, PF (May 2013). "Extrapulmonary manifestations of sarcoidosis.". Rheumatic diseases clinics of North America 39 (2): 277–97. ^ Shimamura, Y; Taniguchi, Y; Yoshimatsu, R; Kawase, S; Yamagami, T; Terada, Y (28 August 2015). 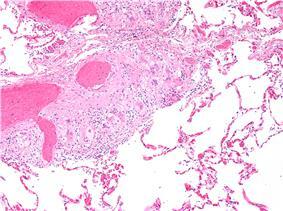 "Granulomatous periostitis and tracheal involvement in sarcoidosis.". Rheumatology (Oxford, England). ^ Korkmaz, C; Efe, B; Tel, N; Kabukçuoglu, S; Erenoglu, E (March 1999). "Sarcoidosis with palpable nodular myositis, periostitis and large-vessel vasculitis stimulating Takayasu's arteritis.". Rheumatology (Oxford, England) 38 (3): 287–8. ^ Rossman MD, Kreider ME; Kreider (August 2007). "Lesson learned from ACCESS (A Case Controlled Etiologic Study of Sarcoidosis)". Proc Am Thorac Soc 4 (5): 453–6. ^ Cathcart S, Sami N, Elewski B; Sami; Elewski (May 2012). "Sarcoidosis as an adverse effect of tumor necrosis factor inhibitors". Journal of Drugs in Dermatology 11 (5): 609–12. ^ Iannuzzi MC (August 2007). "Advances in the genetics of sarcoidosis". Proc Am Thorac Soc 4 (5): 457–60. ^ Spagnolo P, Grunewald J; Grunewald (May 2013). "Recent advances in the genetics of sarcoidosis". Journal of Medical Genetics 50 (5): 290–7. ^ Grunewald J, Eklund A, Olerup O; Eklund; Olerup (March 2004). "Human leukocyte antigen class I alleles and the disease course in sarcoidosis patients". Am. J. Respir. Crit. Care Med. 169 (6): 696–702. ^ Grunewald, J (August 2010). "Review: role of genetics in susceptibility and outcome of sarcoidosis.". Seminars in Respiratory and Critical Care Medicine 31 (4): 380–9. ^ Gialafos, Elias; Triposkiadis, Filippos; Kouranos, Vassilios; Rapti, Aggeliki; Kosmas, Ilias; Manali, Efrosini; Giamouzis, Grigorios; Elezoglou, Antonia; Peros, Ilias (2014-12-01). "Relationship between tumor necrosis factor-α (TNFA) gene polymorphisms and cardiac sarcoidosis". In Vivo (Athens, Greece) 28 (6): 1125–1129. ^ Saidha S, Sotirchos ES, Eckstein C; Sotirchos; Eckstein (March 2012). "Etiology of sarcoidosis: does infection play a role?". The Yale Journal of Biology and Medicine 85 (1): 133–41. ^ a b c Müller-Quernheim J, Prasse A, Zissel G; Prasse; Zissel (June 2012). "Pathogenesis of sarcoidosis". Presse medicale 41 (6 Pt 2): e275–87. ^ Gupta D, Agarwal R, Aggarwal AN, Jindal SK; Agarwal; Aggarwal; Jindal (September 2007). "Molecular evidence for the role of mycobacteria in sarcoidosis: a meta-analysis". Eur. Respir. J. 30 (3): 508–16. ^ Almenoff PL, Johnson A, Lesser M, Mattman LH; Johnson; Lesser; Mattman (May 1996). "Growth of acid fast L forms from the blood of patients with sarcoidosis". Thorax 51 (5): 530–3. ^ Morgenthau AS, Iannuzzi MC; Iannuzzi (January 2011). "Recent advances in sarcoidosis" (PDF). Chest 139 (1): 174–82. ^ Padilla ML, Schilero GJ, Teirstein AS; Schilero; Teirstein (March 2002). "Donor-acquired sarcoidosis". Sarcoidosis Vasc Diffuse Lung Dis 19 (1): 18–24. ^ Romagnani S (June 1997). "The Th1/Th2 paradigm". Immunol. Today 18 (6): 263–6. ^ Morell F, Levy G, Orriols R, Ferrer J, De Gracia J, Sampol G; Levy; Orriols; Ferrer; De Gracia; Sampol (April 2002). "Delayed cutaneous hypersensitivity tests and lymphopenia as activity markers in sarcoidosis". Chest 121 (4): 1239–44. ^ a b c Bargagli E, Olivieri C, Rottoli P; Olivieri; Rottoli (December 2011). "Cytokine modulators in the treatment of sarcoidosis". Rheumatology International 31 (12): 1539–44. ^ Kettritz R, Goebel U, Fiebeler A, Schneider W, Luft F; Goebel; Fiebeler; Schneider; Luft (October 2006). "The protean face of sarcoidosis revisited" (PDF). Nephrology, Dialysis, Transplantation 21 (10): 2690–4. ^ Verschueren K, Van Essche E, Verschueren P, Taelman V, Westhovens R; Van Essche; Verschueren; Taelman; Westhovens (November 2007). "Development of sarcoidosis in etanercept-treated rheumatoid arthritis patients". Clin. Rheumatol. 26 (11): 1969–71. ^ Parrish S, Turner JF; Turner (November 2009). "Diagnosis of sarcoidosis". Disease-a-month 55 (11): 693–703. ^ Hawtin KE, Roddie ME, Mauri FA, Copley SJ; Roddie; Mauri; Copley (August 2010). "Pulmonary sarcoidosis: the 'Great Pretender'". Clinical Radiology 65 (8): 642–50. ^ Baughman RP, Culver DA, Judson MA; Culver; Judson (1 March 2011). "A concise review of pulmonary sarcoidosis". American Journal of Respiratory and Critical Care Medicine 183 (5): 573–81. ^ Miliauskas S, Zemaitis M, Sakalauskas R; Zemaitis; Sakalauskas (2010). "Sarcoidosis—moving to the new standard of diagnosis?" (PDF). Medicina 46 (7): 443–6. ^ a b c Kamangar, N; Rohani, P; Shorr, AF (6 February 2014). Peters, SP; Talavera, F; Rice, TD; Mosenifar, Z, ed. "Sarcoidosis Workup". Medscape Reference. WebMD. Retrieved 19 February 2014. ^ Allmendinger A, Perone R (2009). "Case of the Month". Diagnostic Imaging 31 (9): 10. ^ Joanne Mambretti (2004). "Chest X-ray Stages of Sarcoidosis" (PDF). Journal of Insurance Medicine: 91–92. Retrieved June 3, 2012. ^ White, ES; Lynch Jp, 3rd (June 2007). "Current and emerging strategies for the management of sarcoidosis". Expert Opinion on Pharmacotherapy 8 (9): 1293–1311. ^ Paramothayan NS, Lasserson TJ, Jones PW; Lasserson; Jones (18 April 2005). "Corticosteroids for pulmonary sarcoidosis". The Cochrane Database of Systematic Reviews (2): CD001114. ^ Sahoo DH, Bandyopadhyay D, Xu M, Pearson K, Parambil JG, Lazar CA, Chapman JT, Culver DA; Bandyopadhyay; Xu; Pearson; Parambil; Lazar; Chapman; Culver (November 2011). "Effectiveness and safety of leflunomide for pulmonary and extrapulmonary sarcoidosis" (PDF). The European Respiratory Journal 38 (5): 1145–50. ^ a b Panselinas E, Judson MA; Judson (October 2012). "Acute pulmonary exacerbations of sarcoidosis" (PDF). Chest 142 (4): 827–36. ^ a b c d e f g h i Baughman RP, Nunes H, Sweiss NJ, Lower EE; Nunes; Sweiss; Lower (June 2013). "Established and experimental medical therapy of pulmonary sarcoidosis". The European Respiratory Journal 41 (6): 1424–38. ^ Bhat P, Cervantes-Castañeda RA, Doctor PP, Anzaar F, Foster CS; Cervantes-Castañeda; Doctor; Anzaar; Foster (May–June 2009). "Mycophenolate mofetil therapy for sarcoidosis-associated uveitis". Ocular Immunology and Inflammation 17 (3): 185–90. ^ Androdias G, Maillet D, Marignier R, Pinède L, Confavreux C, Broussolle C, Vukusic S, Sève P; Maillet; Marignier; Pinède; Confavreux; Broussolle; Vukusic; Sève (29 May 2011). "Mycophenolate mofetil may be effective in CNS sarcoidosis but not in sarcoid myopathy". Neurology 76 (13): 1168–72. ^ Judson, MA (October 2012). "The treatment of pulmonary sarcoidosis". Respiratory Medicine 106 (10): 1351–1361. ^ Brill AK, Ott SR, Geiser T; Ott; Geiser (2013). "Effect and safety of mycophenolate mofetil in chronic pulmonary sarcoidosis: a retrospective study". Respiration 86 (5): 376–83. ^ Tikoo RK, Kupersmith MJ, Finlay JL; Kupersmith; Finlay (22 April 2004). "Treatment of Refractory Neurosarcoidosis with Cladribine" (PDF). New England Journal of Medicine 350 (17): 1798–1799. ^ Maneiro JR, Salgado E, Gomez-Reino JJ, Carmona L; Salgado; Gomez-Reino; Carmona; Biobadaser Study (August 2012). "Efficacy and safety of TNF antagonists in sarcoidosis: data from the Spanish registry of biologics BIOBADASER and a systematic review". Seminars in Arthritis and Rheumatism 42 (1): 89–103. ^ Antoniu, SA (January 2010). "Targeting the TNF-alpha pathway in sarcoidosis.". Expert Opinion on Therapeutic Targets 14 (1): 21–9. ^ a b c Beegle SH, Barba K, Gobunsuy R, Judson MA; Barba; Gobunsuy; Judson (2013). "Current and emerging pharmacological treatments for sarcoidosis: a review". Drug Design, Development and Therapy 7: 325–38. ^ Callejas-Rubio JL, López-Pérez L, Ortego-Centeno N; López-Pérez; Ortego-Centeno (December 2008). "Tumor necrosis factor-alpha inhibitor treatment for sarcoidosis". Therapeutics and Clinical Risk Management 4 (6): 1305–13. ^ a b c d Dastoori M, Fedele S, Leao JC, Porter SR; Fedele; Leao; Porter (April 2013). "Sarcoidosis — a clinically orientated review". Journal of Oral Pathology & Medicine 42 (4): 281–9. ^ Bakker GJ, Haan YC, Maillette de Buy Wenniger LJ, Beuers U; Haan; Maillette de Buy Wenniger LJ; Beuers (October 2012). "Sarcoidosis of the liver: to treat or not to treat?" (PDF). The Netherlands Journal of Medicine 70 (8): 349–56. ^ Baughman RP, Judson MA, Ingledue R, Craft NL, Lower EE; Judson; Ingledue; Craft; Lower (February 2012). "Efficacy and safety of apremilast in chronic cutaneous sarcoidosis" (PDF). Archives of Dermatology 148 (2): 262–4. ^ Belkhou A, Younsi R, El Bouchti I, El Hassani S; Younsi; El Bouchti; El Hassani (July 2008). "Rituximab as a treatment alternative in sarcoidosis". Joint, Bone, Spine 75 (4): 511–2. ^ Rosenbloom J, Castro SV, Jimenez S. Fibrotic diseases:cellular and molecular mechanisms and novel therapies.Ann Intern Med 2010;152:159-66. ^ Julian MW, Shao G, Schlesinger LS, Huang Q, Cosmar DG, Bhatt NY, Culver DA, Baughman RP, Wood KL, Crouser ED; Shao; Schlesinger; Huang; Cosmar; Bhatt; Culver; Baughman; Wood; Crouser (1 February 2013). "Nicotine treatment improves Toll-like receptor 2 and Toll-like receptor 9 responsiveness in active pulmonary sarcoidosis" (PDF). Chest 143 (2): 461–70. ^ Drake WP, Oswald-Richter K, Richmond BW, Isom J, Burke VE, Algood H, Braun N, Taylor T, Pandit KV, Aboud C, Yu C, Kaminski N, Boyd AS, King LE; Oswald-Richter; Richmond; Isom; Burke; Algood; Braun; Taylor; Pandit; Aboud; Yu; Kaminski; Boyd; King (September 2013). "Oral antimycobacterial therapy in chronic cutaneous sarcoidosis: a randomized, single-masked, placebo-controlled study". JAMA Dermatology 149 (9): 1040–9. ^ Boots AW, Drent M, de Boer VC, Bast A, Haenen GR; Drent; De Boer; Bast; Haenen (August 2011). "Quercetin reduces markers of oxidative stress and inflammation in sarcoidosis". Clinical Nutrition 30 (4): 506–12. ^ "What Is Sarcoidosis?". National Heart, Lung and Blood Institute. National Institutes of Health. 14 June 2013. Retrieved 21 February 2014. ^ a b c Syed J, Myers R; Myers (January 2004). "Sarcoid heart disease". Can J Cardiol 20 (1): 89–93. ^ Sadek MM, Yung D, Birnie DH, Beanlands RS, Nery PB; Yung; Birnie; Beanlands; Nery (September 2013). "Corticosteroid therapy for cardiac sarcoidosis: a systematic review". Can J Cardiol 29 (9): 1034–41. ^ Karakantza M, Matutes E, MacLennan K, O'Connor NT, Srivastava PC, Catovsky D; Matutes; MacLennan; O'Connor; Srivastava; Catovsky (1996). "Association between sarcoidosis and lymphoma revisited". J. Clin. Pathol. 49 (3): 208–12. ^ Askling J, Grunewald J, Eklund A, Hillerdal G, Ekbom A; Grunewald; Eklund; Hillerdal; Ekbom (November 1999). "Increased risk for cancer following sarcoidosis". Am. J. Respir. Crit. Care Med. 160 (5 Pt 1): 1668–72. ^ Tana C, Giamberardino MA, Di Gioacchino M, Mezzetti A, Schiavone C; Giamberardino; Di Gioacchino; Mezzetti; Schiavone (April–June 2013). "Immunopathogenesis of sarcoidosis and risk of malignancy: a lost truth?". International Journal of Immunopathology and Pharmacology 26 (2): 305–13. ^ Kornacker M, Kraemer A, Leo E, Ho AD; Kraemer; Leo; Ho (2002). "Occurrence of sarcoidosis subsequent to chemotherapy for non-Hodgkin's lymphoma: report of two cases". Ann. Hematol. 81 (2): 103–5. ^ Suvajdzic N, Milenkovic B, Perunicic M, Stojsic J, Jankovic S; Milenkovic; Perunicic; Stojsic; Jankovic (2007). "Two cases of sarcoidosis-lymphoma syndrome". Med. Oncol. 24 (4): 469–71. ^ Yao M, Funk GF, Goldstein DP, DeYoung BR, Graham MM; Funk; Goldstein; Deyoung; Graham (2005). "Benign lesions in cancer patients: Case 1. Sarcoidosis after chemoradiation for head and neck cancer". J. Clin. Oncol. 23 (3): 640–1. ^ Yamasawa H, Ishii Y, Kitamura S; Ishii; Kitamura (2000). "Concurrence of sarcoidosis and lung cancer. A report of four cases". Respiration 67 (1): 90–3. ^ Zambrana F, Antúnez A, García-Mata J, Mellado JM, Villar JL; Antúnez; García-Mata; Mellado; Villar (2009). "Sarcoidosis as a diagnostic pitfall of pancreatic cancer". Clin Transl Oncol 11 (6): 396–8. ^ Schiller G, Said J, Pal S; Said; Pal (2003). "Hairy cell leukemia and sarcoidosis: a case report and review of the literature". Leukemia 17 (10): 2057–9. ^ Maloisel F, Oberling F; Oberling (1992). "Acute myeloid leukemia complicating sarcoidosis". J R Soc Med 85 (1): 58–9. ^ Reich JM (1985). "Acute myeloblastic leukemia and sarcoidosis. Implications for pathogenesis". Cancer 55 (2): 366–9. ^ Sam, Amir H.; James T.H. Teo (2010). Rapid Medicine. ^ Henke CE, Henke G, Elveback LR, Beard CM, Ballard DJ, Kurland LT; Henke; Elveback; Beard; Ballard; Kurland (1986). "The epidemiology of sarcoidosis in Rochester, Minnesota: a population-based study of incidence and survival" (PDF). Am. J. Epidemiol. 123 (5): 840–5. ^ Rutherford RM, Brutsche MH, Kearns M, Bourke M, Stevens F, Gilmartin JJ; Brutsche; Kearns; Bourke; Stevens; Gilmartin (September 2004). "Prevalence of coeliac disease in patients with sarcoidosis". Eur J Gastroenterol Hepatol 16 (9): 911–5. ^ a b Baughman RP, Lower EE, du Bois RM; Lower; Du Bois (29 March 2003). "Sarcoidosis". Lancet 361 (9363): 1111–8. ^ a b Lazarus, A (November 2009). "Sarcoidosis: epidemiology, etiology, pathogenesis, and genetics.". Disease-a-month 55 (11): 649–60. ^ a b c d e f g Sharma, OP (2005). "Chapter 1: Deﬁnition and history of sarcoidosis". Sarcoidosis. Sheffield: European Respiratory Society Journals. ^ Babalian, L (26 January 1939). "Disease of Besnier-Boeck-Schaumann". New England Journal of Medicine 220 (4): 143–145. ^ "Join WASOG". World Association of Sarcoidosis and other Granulomatous Disease. Retrieved 21 February 2014. ^ "Mission & Goals". Foundation for Sarcoidosis Research. Retrieved 21 February 2014. ^ Izbicki G, Chavko R, Banauch GI, Weiden MD, Berger KI, Aldrich TK, Hall C, Kelly KJ, Prezant DJ; Chavko; Banauch; Weiden; Berger; Aldrich; Hall; Kelly; Prezant (May 2007). "World Trade Center "sarcoid-like" granulomatous pulmonary disease in New York City Fire Department rescue workers" (PDF). Chest 131 (5): 1414–23. ^ "9/11 Health - What We Know About the Health Effects of 9/11". NYC. US Government. Retrieved 22 February 2014. ^ Grimes, William (10 Aug 2008). "Bernie Mac, Acerbic Stand-Up Comedian and Irascible TV Dad, Dies at 50". The New York Times. Retrieved 30 April 2014. ^ Charlier P, Froesch P; Froesch (2013). "Robespierre: the oldest case of sarcoidosis?". Lancet 382 (9910): 2068. ^ Subramanian P, Chinthalapalli H, Krishnan M; Chinthalapalli; Krishnan; Tarlo; Lobbedez; Pineda; Oreopoulos (September 2004). "Pregnancy and sarcoidosis: an insight into the pathogenesis of hypercalciuria". Chest 126 (3): 995–8. Comedian & actor Bernie Mac suffered from sarcoidosis. In 2005, he mentioned that the disease was in remission. His death on August 9, 2008 was caused by complications from pneumonia, which was precipitated by pulmonary scarring attributed to his sarcoidosis. The World Association of Sarcoidosis and Other Granulomatous Disorders (WASOG) is an organisation of physicians involved in the diagnosis and treatment of sarcoidosis and related conditions. WASOG publishes the journal Sarcoidosis, Vasculitis, and Diffuse Lung Diseases. Additionally, the Foundation for Sarcoidosis Research (FSR) is devoted to supporting research into sarcoidosis and its possible treatments. Recently selective phosphodiesterase 4 (PDE4) inhibitors like apremilast (a thalidomide derivative), roflumilast, and the less subtype-selective PDE4 inhibitor, pentoxifylline, have been tried as a treatment for sarcoidosis, with successful results being obtained with apremilast in cutaneous sarcoidosis in a small open-label study. Pentoxifylline has been used successfully to treat acute disease although its use is greatly limited by its gastrointestinal toxicity (mostly nausea, vomiting, and diarrhea). Case reports have supported the efficacy of rituximab, an anti-CD20 monoclonal antibody and a clinical trial investigating atorvastatin as a treatment for sarcoidosis is under-way. ACE inhibitors have been reported to cause remission in cutaneous sarcoidosis and improvement in pulmonary sarcoidosis, including improvement in pulmonary function, remodeling of lung parenchyma and prevention of pulmonary fibrosis in separate case series'. Nicotine patches have been found to possess anti-inflammatory effects in sarcoidosis patients, although whether they had disease-modifying effects requires further investigation. Antimycobacterial treatment (drugs that kill off mycobacteria, the causative agents behind tuberculosis and leprosy) has also proven itself effective in treating chronic cutaneous (that is, it affects the skin) sarcoidosis in one clinical trial. Quercetin has also been tried as a treatment for pulmonary sarcoidosis with some early success in one small trial. In a clinical trial cyclosporine added to prednisone treatment failed to demonstrate any significant benefit over prednisone alone in people with pulmonary sarcoidosis, although there was evidence of increased toxicity from the addition of cyclosporine to the steroid treatment including: infections, malignancies (cancers), hypertension, and kidney dysfunction. Likewise chlorambucil and cyclophosphamide are seldom used in the treatment of sarcoidosis due to their high degree of toxicity, especially their potential for causing malignancies. Infliximab has been used successfully to treat pulmonary sarcoidosis in clinical trials in a number of persons. Etanercept, on the other hand, has failed to demonstrate any significant efficacy in people with uveal sarcoidosis in a couple of clinical trials. Likewise golimumab has failed to show any benefit in persons with pulmonary sarcoidosis. One clinical trial of adalimumab found treatment response in about half of subjects, which is similar to that seen with infliximab, but as adalimumab has better tolerability profile it may be preferred over infliximab. Severe symptoms are generally treated with corticosteroids although steroid-sparing agents such as azathioprine, methotrexate, mycophenolic acid, and leflunomide are often used as alternatives. Of these, methotrexate is most widely used and studied. Methotrexate is considered a first-line treatment in neurosarcoidosis, often in conjunction with corticosteroids. Long-term treatment with methotrexate is associated with liver damage in about 10% of people and hence may be a significant concern in people with liver involvement and requires regular liver function test monitoring. Methotrexate can also lead to pulmonary toxicity (lung damage), although this is fairly uncommon and more commonly it can confound the leukopenia caused by sarcoidosis. Due to these safety concerns it is often recommended that methotrexate is combined with folic acid in order to prevent toxicity. Azathioprine treatment can also lead to liver damage. Leflunomide is being used as a replacement for methotrexate, possibly due to its purportedly lower rate of pulmonary toxicity. Mycophenolic acid has been used successfully in uveal sarcoidosis, neurosarcoidosis (especially CNS sarcoidosis; minimally effective in sarcoidosis myopathy), and pulmonary sarcoidosis. Most persons (>75%) only require symptomatic treatment with non-steroidal anti-inflammatory drugs (NSAIDs) like ibuprofen or aspirin. For persons presenting with lung symptoms, unless the respiratory impairment is devastating, active pulmonary sarcoidosis is observed usually without therapy for two to three months; if the inflammation does not subside spontaneously, therapy is instituted. Corticosteroids, most commonly prednisone or prednisolone, have been the standard treatment for many years. In some people, this treatment can slow or reverse the course of the disease, but other people do not respond to steroid therapy. The use of corticosteroids in mild disease is controversial because in many cases the disease remits spontaneously. Despite their widespread use, the evidence supporting corticosteroid use is weak at best. Although people with stage 1 X-rays tend to have the acute or subacute, reversible form of the disease, those with stages 2 and 3 often have the chronic, progressive disease; these patterns do not represent consecutive "stages" of sarcoidosis. Thus, except for epidemiologic purposes, this X-ray categorization is mostly of historic interest. Serum markers of sarcoidosis, include: serum amyloid A, soluble interleukin 2 receptor, lysozyme, angiotensin converting enzyme, and the glycoprotein KL-6. Angiotensin-converting enzyme blood levels are used in the monitoring of sarcoidosis. A bronchoalveolar lavage can show an elevated (of at least 3.5) CD4/CD8 T cell ratio, which is indicative (but not proof) of pulmonary sarcoidosis. In at least one study the induced sputum ratio of CD4/CD8 and level of TNF was correlated to those in the lavage fluid. Diagnosis of sarcoidosis is a matter of exclusion, as there is no specific test for the condition. To exclude sarcoidosis in a case presenting with pulmonary symptoms might involve fungi. The major implicated infectious agents include:  Several infectious agents appear to be significantly associated with sarcoidosis, but none of the known associations is specific enough to suggest a direct causative role. Chronic sarcoid arthritis usually occurs in the setting of more diffuse organ involvement. The ankles, knees, wrists, elbows, and hands may all be affected in the chronic form and often this presents itself in a polyarticular pattern. Dactylitis similar to that seen in Psoriatic arthritis, that is associated with pain, swelling, overlying skin erythema, and underlying bony changes may also occur. Development of Jaccoud arthropathy (a nonerosive deformity) is very rarely seen. There are two ways that arthritic syndromes can be categorized in: acute or chronic. Sarcoidosis patients with acute arthritis often also accompanies bilateral Hilar lymphadenopathy and Erythema nodosum. These three associated syndromes often occurs in Löfgren syndrome. When looking at the arthritis symptoms of Löfgren syndrome, it shows that the ankles are most commonly affected, followed by the knees, wrists, elbows, wrists, and metacarpophalangeal joints. Usually true arthritis is not present, but instead periarthritis presents itself as a swelling in the soft tissue around the joints that can be seen by ultrasonographic methods. These joint symptoms tend to precede or occur at the same time as erythema nodosum develops. Even when erythema nodosum is absent, it is believed that the combination of hilar lymphadenopathy and ankle periarthritis van be considered as a variant of Löfgren syndrome. Enthesitis also occurs in about one-third of patients with acute sarcoid arthritis, mainly affecting the Achilles tendon and heels. Soft tissue swelling at the ankles can be prominent, and biopsy of this soft tissue reveals no granulomas but does show panniculitis that is similar to erythema nodosum. Abnormal clinical blood tests are frequent, accounting for over 50% of cases, but is not diagnostic. Lymphopenia is the most common hematologic anomaly in sarcoidosis. Anemia occurs in about 20% of people with sarcoidosis. Leukopenia is less common and occurs in even fewer persons but is rarely severe. Thrombocytopenia and hemolytic anemia are fairly rare. In the absence of splenomegaly, leukopenia may reflect bone marrow involvement, but the most common mechanism is a redistribution of blood T cells to sites of disease. Other nonspecific findings include monocytosis, occurring in the majority of sarcoidosis cases, increased hepatic enzymes or alkaline phosphatase. People with sarcoidosis often have immunologic anomalies like allergies to test antigens such as Candida or purified protein derivative (PPD). Polyclonal hypergammaglobulinemia is also a fairly common immunologic anomaly seen in sarcoidosis. Parotid enlargement occurs in about 5–10% of persons. Bilateral involvement is the rule. The gland is usually not tender, but firm and smooth. Dry mouth can occur; other exocrine glands are affected only rarely. The eyes, their glands, or the parotid glands are affected in 20%-50% of cases. Prolactin is frequently increased in sarcoidosis, between 3% and 32% of cases have hyperprolactinemia this frequently leads to amenorrhea, galactorrhea, or nonpuerperal mastitis in women. It also frequently causes an increase in 1,25-dihydroxy vitamin D, the active metabolite of vitamin D, which is usually hydrolysed within the kidney, but in sarcoidosis patients hydroxylation of vitamin D can occur outside the kidneys, namely inside the immune cells found in the granulomas the condition produces. 1 alpha, 25(OH)2D3 is the main cause for hypercalcemia in sarcoidosis and overproduced by sarcoid granulomata. Gamma-interferon produced by activated lymphocytes and macrophages plays a major role in the synthesis of 1 alpha, 25(OH)2D3. Hypercalciuria (excessive secretion of calcium in one's urine) and hypercalcemia (an excessively high amount of calcium in the blood) are seen in <10% of individuals and likely results from the increased 1,25-dihydroxy vitamin D production. Thyroid dysfunction is seen in 4.2–4.6% of cases. Any of the components of the nervous system can be involved. Sarcoidosis affecting the nervous system is known as neurosarcoidosis. Cranial nerves are most commonly affected, accounting for about 5–30% of neurosarcoidosis cases, and peripheral facial nerve palsy, often bilateral, is the most common neurological manifestation of sarcoidosis. It occurs suddenly and is usually transient. The central nervous system involvement is present in 10–25% of sarcoidosis cases. Other common manifestations of neurosarcoid include optic nerve dysfunction, papilledema, palate dysfunction, neuroendocrine changes, hearing abnormalities, hypothalamic and pituitary abnormalities, chronic meningitis, and peripheral neuropathy. Myelopathy, that is spinal cord involvement, occurs in about 16–43% of neurosarcoidosis cases and is often associated with the poorest prognosis of the neurosarcoidosis subtypes. Whereas facial nerve palsies and acute meningitis due to sarcoidosis tends to have the most favourable prognosis. Another common finding in sarcoidosis with neurological involvement is autonomic or sensory small fiber neuropathy. Neuroendocrine sarcoidosis accounts for about 5–10% of neurosarcoidosis cases and can lead to diabetes insipidus, changes in menstrual cycle and hypothalamic dysfunction. The latter can lead to changes in body temperature, mood and prolactin (see the endocrine and exocrine section for details). Eye involvement occurs in about 10–90% of cases. Manifestations in the eye include uveitis, uveoparotitis, and retinal inflammation, which may result in loss of visual acuity or blindness. The most common ophthalmologic manifestation of sarcoidosis is uveitis. The combination of anterior uveitis, parotitis, VII cranial nerve paralysis and fever is called uveoparotid fever or Heerfordt syndrome (D86.8). Development of scleral nodule associated with sarcoidosis have been observed. The frequency of cardiac involvement varies and is significantly influenced by race; in Japan over 25% of persons with sarcoidosis experience symptomatic cardiac involvement, whereas in the US and Europe only about 5% of cases present with cardiac involvement. Autopsy studies in the US have revealed a frequency of cardiac involvement of about 20–30%, whereas autopsy studies in Japan have shown a frequency of 60%. The presentation of cardiac sarcoidosis can range from asymptomatic conduction abnormalities to fatal ventricular arrhythmia. Conduction abnormalities are the most common cardiac manifestations of sarcoidosis among persons and can include complete heart block. Second to conduction abnormalities, in frequency, are ventricular arrhythmias and occurs in about 23% of persons with cardiac involvement. Sudden cardiac death, either due to ventricular arrhythmias or complete heart block is a rare complication of cardiac sarcoidosis. Cardiac sarcoidosis can cause fibrosis, granuloma formation or the accumulation of fluid in the interstitium of the heart or a combination of the former two. 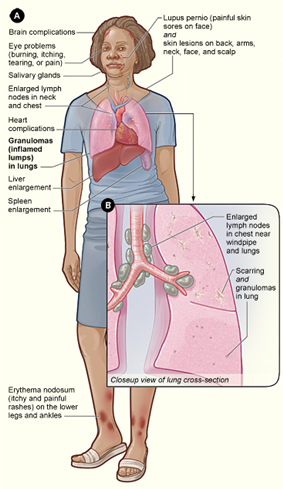 Sarcoidosis of the lungs can be divided into four stages. Stage 0 — No intrathoracic involvement. Stage I — Bilateral hilar adenopathy. Stage II — Pulmonary parenchyma involved. Stage III — Pulmonary infiltrates with fibrosis. Stage 4 is end-stage lung disease with pulmonary fibrosis and honeycombing. Localization to the lungs is by far the most common manifestation of sarcoidosis. At least 90% of affected persons experience lung involvement. Overall, about 50% develop permanent pulmonary abnormalities, and 5 to 15% have progressive fibrosis of the lung parenchyma. Sarcoidosis of the lung is primarily an interstitial lung disease in which the inflammatory process involves the alveoli, small bronchi and small blood vessels. In acute and subacute cases, physical examination usually reveals dry rales. At least 5% of persons will suffer pulmonary arterial hypertension. Less commonly, the upper respiratory tract (including the larynx, pharynx, and sinuses) may be affected, which occurs in between 5 and 10% of cases. The combination of erythema nodosum, bilateral hilar lymphadenopathy, and joint pain is called Löfgren syndrome which has a relatively good prognosis. This form of the disease occurs significantly more commonly in Scandinavian patients, than in those of non-Scandinavian origin. Sarcoidosis was first described in 1877 by an English doctor named Dr. Jonathan Hutchinson as a skin disease causing red, raised lesions on the arms, face, and hands. In the United States it most commonly affects people of Northern European (especially Scandinavian or Icelandic) or African/African American ancestry between the ages of 20 and 29, although any race or age group can be affected. Japan has a lower rate of sarcoidosis than the United States, although in these people the disease is usually more aggressive in its course with the heart often affected. Japanese individuals also have a different peak age for sarcoidosis, 25–40 years of age. It occurs about twice as often in women, where it usually takes a more aggressive course. In developing countries, it often goes misdiagnosed as tuberculosis (TB) as its symptoms often resemble those of TB. Treatment is usually designed to help relieve the symptoms and thus does not directly alter the course of the disease. This treatment usually consists of anti-inflammatory drugs like ibuprofen or aspirin. In cases where the condition develops to the point that it has a progressive and/or life-threatening course, the treatment is most often steroid treatment with prednisone or prednisolone. Alternatively, drugs that are most commonly used to treat cancer and suppress the immune system, such as methotrexate, azathioprine and leflunomide, may be used. The average mortality rate is less than 5% in untreated cases.